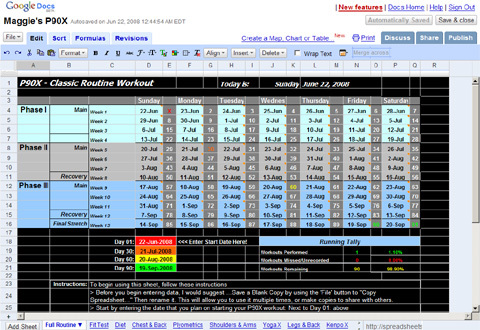 A few months ago reader Scott Rhamy sent me a link to a P90X workout log spreadsheet he had enhanced and ported over to Google Docs from the original Excel sheet created by Damon which is no longer online. I haven’t had the chance to look it over very well until now, but since I just loaded up the P90X Chest and Back workout tonight for some variety, I decided to revisit the spreadsheet. After filling in some of my information and digging around a bit, I have to admit that this is one handy spreadsheet. It will track your reps and weights on resistance days and workout completion/heart rate on cardio and flexibility days. There is also a sheet to log your starting and ending fit test scores as well as fields to link to your progress photos on the Picasa online photo gallery. A body fat calculator based on caliper measurements and a circumference measurement table are also included. For those of you following the P90X nutrition plan, there is also a Diet worksheet that allows you to log the number of portions you eat each day in the permitted food groups. The logs are divided into three phases with the recommended portion numbers adjusted for each phase. Your calorie level is also calculated for you based on your starting weight. There are no pretty graphs for the more visually-oriented of you, but as a whole, this is a great spreadsheet for logging your P90X workouts, and best of all–it’s free! To use the spreadsheet, you will need to click on the File button on the upper left and either click “Copy Spreadsheet” to save it under a new name in your own Google Docs account, or “Export” > “.XLS” to save it to your own computer in Excel format. This entry was posted in Downloads, Fitness and Health, Fitness On A Budget. I agree, I love this spreadsheet. It’s very useful, thanks! I don’t know who created these but I stumbled upon them while searching for a Power 90 calendar to go with my ebay discs. They seem to be for sale via a number of sites including ebay.ca. I may pony up for the Power90 version ($9.77 per worksheet) if I can’t track down any of the Power 90 tools online. Thanks for the kind words about the spreadsheet. I have found that after I created the original version 2 years ago, lots of people of tweaked it and turned it in to their own. With that being said, I’m working on a new version that will encompass P90, P90X & P90X Plus. I hope to make it more dynamic in nature and create it in a web form as well. My goal is to still make it freely available to all P90 people. Anyway, I just wanted to send out a comment. I try to troll around sometimes to find out where this thing ends up and I’m glad that people are finding it useful. thanks so much. this is a whole lot easier than keeping track of papers. When I click on Edit to save to my hard drive there are no options to “copy spreadsheet” or “export” to .xls. I have tried both Firefox and IE. Billy – Please click on the Edit This Page link, then when the new page comes up, go to the upper left corner and click on FILE. From there you should have the option to either Create a Copy or Export (to .XLS, etc.). I didn’t see the edit spreadsheet on the bottom of the page. Hi, I’m new to this P90X program & i have few questions… I’m pro volleyball player & I’m in a preety good shape… I’ was wondering should i take P90X classic or double? Can anyone explain me the difference? Oh & one more question…About that workout sheet. There is an exercise for each day, and i takes about an hour… Can we split it in half and do one half in the morning, and the other in the evening? This spreadsheet is the best item I have seen. I love te fact that it truly helps track all your stats. My hubby and I are doing this workout together and the spreadsheet just helps it go by much faster. Thanks for taking the time to do this to benefit all of us. We are going to try to adapt the sheet for the Doubles routine which is what we will do once we finish the first 90 days.